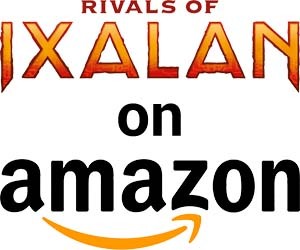 After covering the common and uncommon cards last week, I’m convinced that Rivals of Ixalan will be better received than its predecessor set, Ixalan. 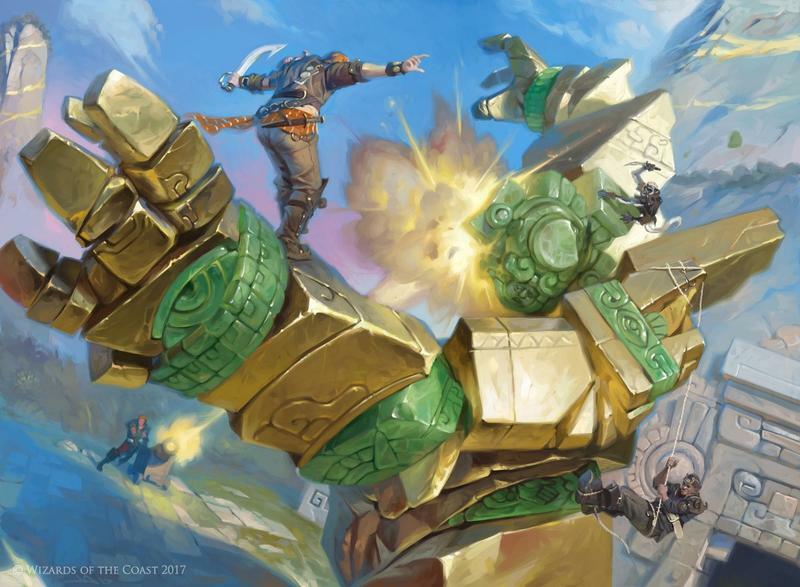 The addition of dual lands at uncommon and Evolving Wilds at common means players will be able to dig, expand, and splash more, no longer solely relying on the limitations of two-color tribes and their synergies to win games. 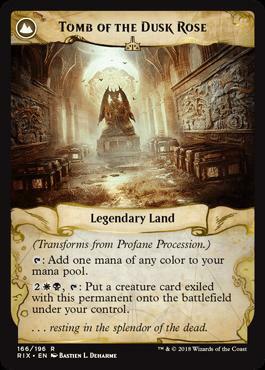 If this is the last “small expansion” that Wizards of the Coast plans to release, hopefully, it goes out with a bang. 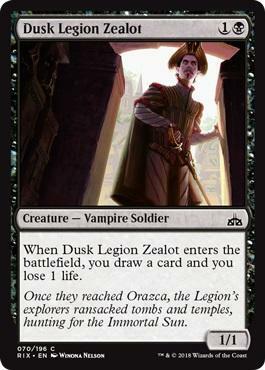 In fact, everyone cheered the death of “small sets,” but after Hour of Devastation and now Rivals of Ixalan improved on their predecessors, I’m not so sure I want to totally say goodbye to them anymore. Either way, these are our favorite rare cards in Rivals of Ixalan, which should be available by the time this article is published. After a draft or two, my opinions might change, but these are the ten cards I’ll be looking for first when opening packs of Magic: The Gathering this weekend. Remember, we’re looking at these rares in terms of Limited Magic games, meaning Sealed or Draft. Another friendly reminder, all of these cards are in direct competition with Ravenous Chupacabra, one of the most overpowered uncommon cards in recent memory. 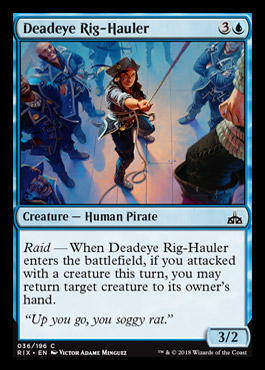 As I write, I’ll try to establish a line between the rare cards I would take over this card and the cards I wouldn’t. Trust me, it’s going to be a high threshold. 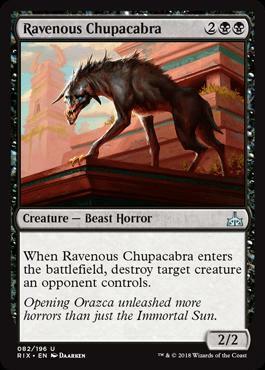 Ravenous Chupacabra is one fine Magic card. I’ll just go ahead and drop Kumena in here. He’s not a great as some cards, but even just a 2/4 for three mana is a good deal. The thing about him, and indeed Merfolk in general, is that the tribe is just as focused as ever. Live by Merfolk, die by Merfolk. Kumena at least provides some much-needed strength at rare for a tribe that mostly got by on uncommons in the last set. 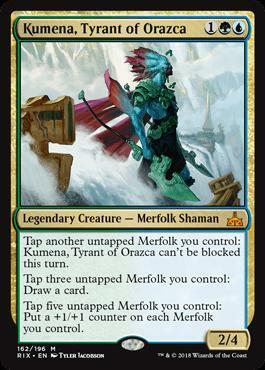 Neither Kopala, Warden of Waves nor Tishana, Voice of Thunder provided the raw power to push Merfolk over the top like Kumena does. 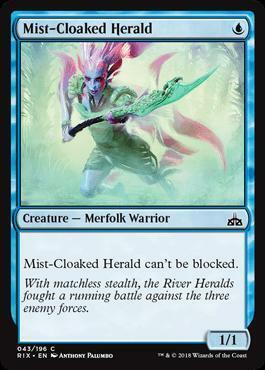 Tapping one Merfolk to make him unblockable is a solid way to end the game once he’s huge, and tapping five Merfolk to pump the entire team is also a great way to get everyone there. However, it is in his draw ability that Kumena finds his true potential. 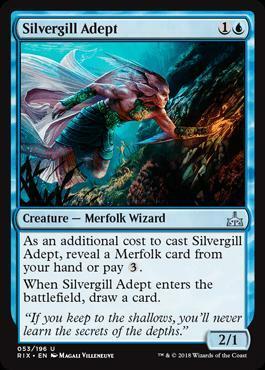 Take him early, load up on cheap Merfolk, and hopefully, you’ll have two in play by the time he hits the battlefield. Remember, Kumena can tap himself. 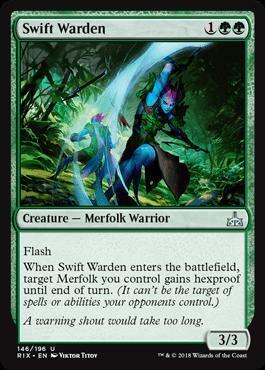 Afterwards, Jungle Delver, Kumena’s Speaker, Shaper Apprentice, Deeproot Warrior, River Sneak, Merfolk Branchwalker, Deeproot Elite, Silvergill Adept, Merfolk Mistbinder, Mist-Cloaked Herald, Jade Bearer, and Giltgrove Stalker are all of the effective one-drop or two-drop Merfolk that can give him targets quickly. The usual bigger Merfolk also work later in the game. 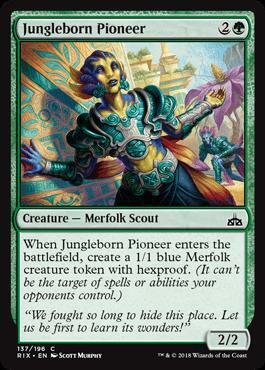 Jungleborn Pioneer, Aquatic Incursion, and Deeproot Waters also jump in value with Kumena since they provide Merfolk that will always be there to help him out. Merfolk was the best draft deck in Ixalan, and when tied with the blazing new uncommons of Rivals of Ixalan, Kumena is destined to become the rare that holds the tribe together. I like ’em big, dumb, and green. 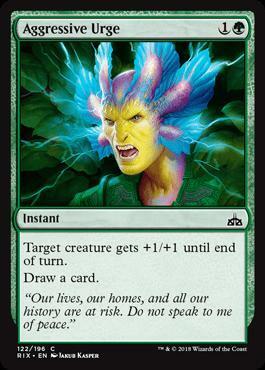 While Blue/Red has taken over as my favorite color combination in Magic, my Green roots still run deep to my soul and burn at the thought of running out a 12/12 in a game of Limited Magic. That casting cost might seem a bit absurd, but it’s not all that high once you realize that a host of common and uncommon cards can help you bring it down by turn-6 or turn-7 with a little luck…maybe even as early as turn-4! 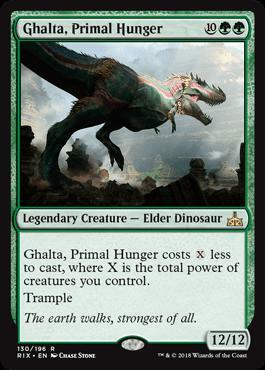 Crested Herdcaller gets you halfway there on turn-5 by itself, and with a sixth land drop on turn-6, Ghalta is all yours. Knight of the Stampede is another best friend to Ghalta, donating not only 2 power to its cause but also the ability to make him cost two less. 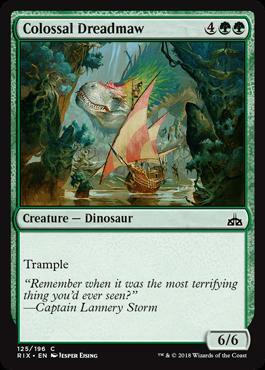 Ghalta makes a boring, vanilla Dinosaur like Orcaza Frillback something to seek out, and Ixalan also has a host of playable Green Dinosaurs like Ravenous Daggertooth, Grazing Whiptail, Drover of the Mighty, and Snapping Sailback, all of which keep Ghalta well within casting range. You don’t even need to be playing a Dinosaurs deck to use him! With enough cheap Merfolk and +1/+1 counters, casting him could be a breeze so long as your counters gameplan comes together. If all else fails, Colossal Dreadmaw turn-6, Ghalta turn-7. He’s not a total game ender since he can lose to plenty of removal spells, most notably Impale and our friend Ravenous Chupacabra. 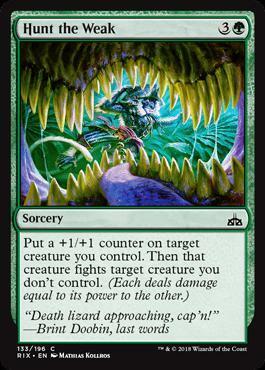 However, Trample on a 12/12 is definitely something your opponent is going to have to account for if they want to survive. Without an answer, Ghalta will end the game within one or two turns for you. Another pipe-dream rare I really want to see succeed. 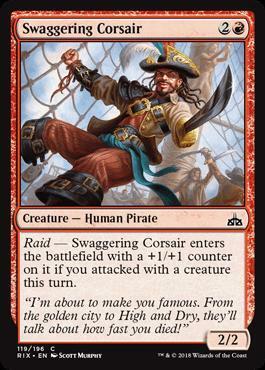 I’m all about Blue/Red Pirates in Rivals of Ixalan, and this is the card that keeps it all together. 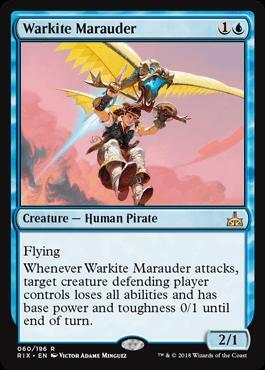 Warkite Maurader checks off all the usual boxes for a nice aggressive Pirate: easy to cast, aggressively paced at 2/1, has an evasive ability in Flying. 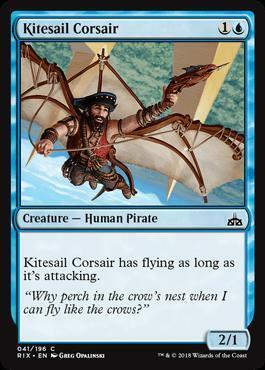 Kitesail Corsair at common is a very fair comparison. This also means that Warkite Maurader needs a killer ability to boost her all the way to rare status, and that’s just what she has. Her ridiculous text box keeps larger creatures in check, shrinking them into wimps that stand no chance at rumbling with her or her fellow charging brigadiers. 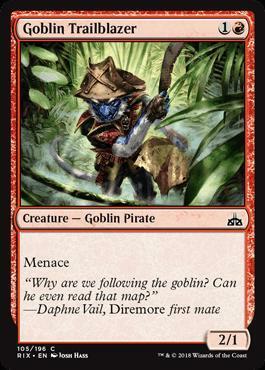 Can you imagine bringing Ghalta down just to have him turn into an 0/1 on the next turn, unable to chew up a wimpy Pirate? I’d be pretty upset. The fun doesn’t stop there! 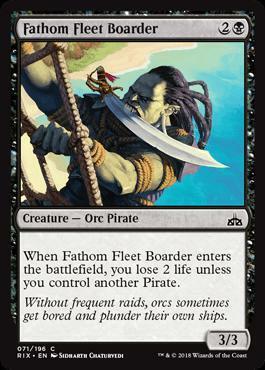 Pirates play dirty in Ixalan and there are plenty of ways to outright kill a 0/1 on the spot. 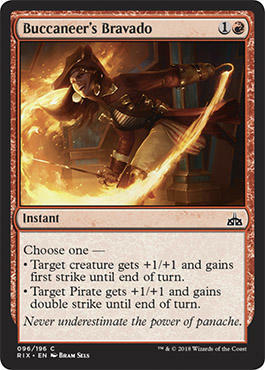 Fanatical Firebrand is the most obvious combo you want with Warkite Maurader since both will be staples of an aggro Pirate deck. Killing Ghalta with a 1/1 Haste Goblin is the dirtiest of all moves in Magic, but I suspect it will happen pretty often. Mutiny will also get the job done after combat. If you’re Blue/Black Pirates, don’t pass up on Moment of Craving. 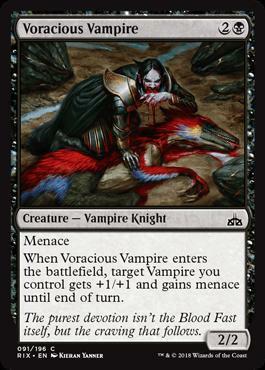 Just because a Vampire is in the art doesn’t mean your scalawags can’t benefit from this card. It easily kills an 0/1 token and gains you two life. If you have no tricks, you at least removed an opponents largest blocker from the battlefield. Can’t argue with that. 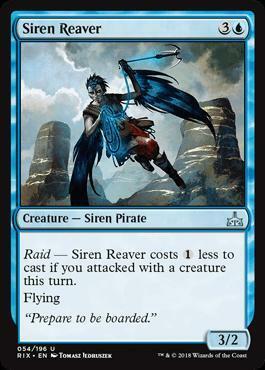 All three two-drop rare pirates are slick in Rivals of Ixalan, but Blue’s is the one I want to try the most. 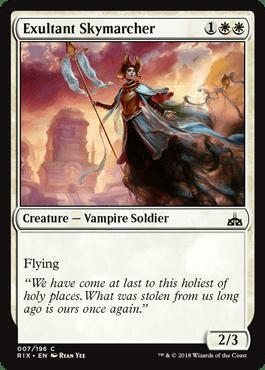 Like I said in the uncommons review, White removal spells bore me. 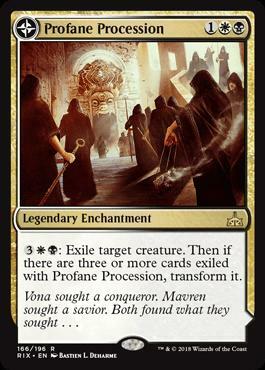 Baffling End and Luminous Bonds are efficient, excellent cards that you would never in your right mind remove from a Limited deck, but man oh man, they are lame to write about. Bishop of Binding is not. This card is nasty, and I want as many of these as possible. 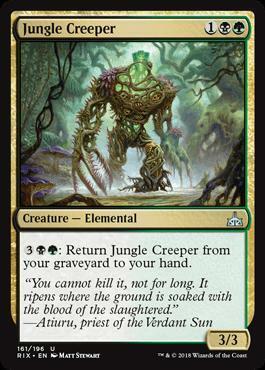 At four mana, the effect of exiling a creature alone is worth the cost. 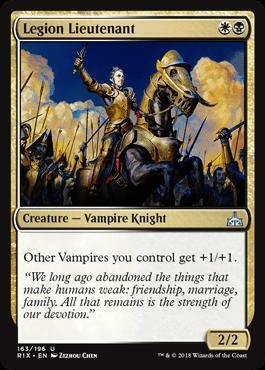 However, when that creature boosts the bishop’s stats, you’re very likely to both have the biggest creature on the battlefield and have effectively two-for-one’d your opponent, removing from their board state and adding something huge to yours. 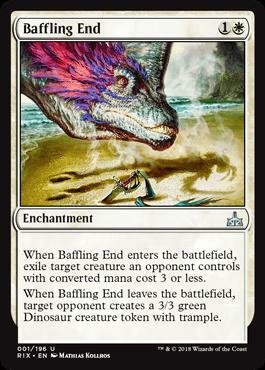 Most of the time, Bishop of Binding will enter the battlefield as a 3/3 or a 4/4, but with a nice Dinosaur target, I can see him getting up to a 5/5 or a 6/6 on occasion. 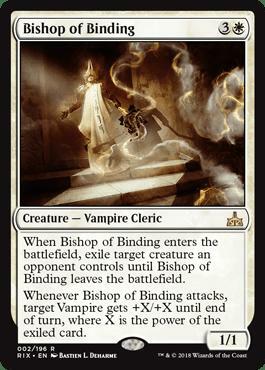 At that point, killing Bishop of Binding will be tough, but if pulled off, your opponent gets their creature back. Hence why I’m still leaning towards Ravenous Chupacabra over it. There’s no coming back from that pit. The only things holding Azor back from being a true Limited bomb is that White/Blue control decks are not a supported archetype in Ixalan. 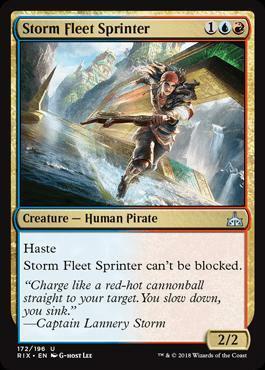 Splashing for him is also difficult in spite of the generous dual mana Rivals of Ixalan brings to the table. 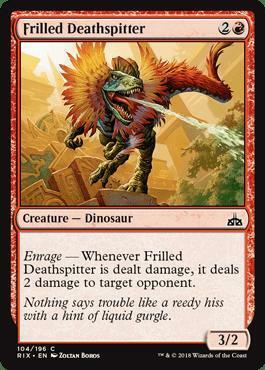 However, if you are somehow able to cast him, it’s essentially “game over.” Nothing noteworthy can effectively attack into him outside of this biggest, rarest Dinosaurs, and opponents won’t be able to rely Impale or Contract Killing on the following turn to get rid of him. Of course, they certainly can kill him with… you guessed it… Ravenous Chupacabra. Azor doesn’t stop creature spells. If an opponent relies on White removal like Divine Verdict to kill him while he’s attacking, you can still tap out and draw at least three cards off of him, which should be enough ammunition in your hand to close out the game. 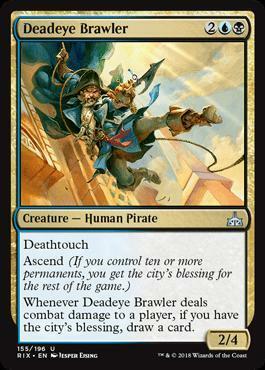 The two best colors for containing this guy are his own, White and Blue, mostly thanks to counterspells and enchantment removals. However, since you’re most likely the only White/Blue player at the table, you should have no trouble competing to scoop them all up. 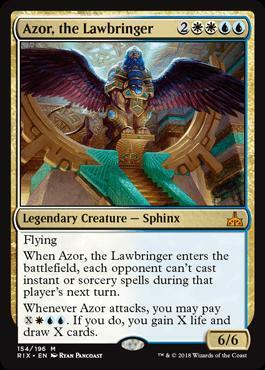 Using Azor is easy, but building around him is the tough part. 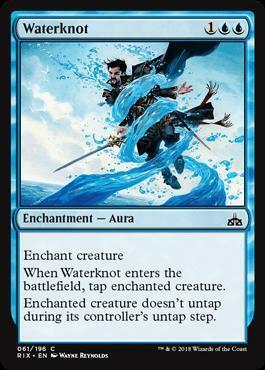 At common, look for Sailor of Means, Waterknot, Crashing Tide, Sea Legs, Luminous Bonds, Divine Verdict, Exultant Skymarcher, and Martyr of Dusk to keep your opponent at bay long enough to cast him. Another 1/1 for four mana that will still leave opponents shaking in their boots. Immediately after Elenda comes down, you’ll have the ability to attack freely into an opponent since they are not going to want to trade and allow her to grow any bigger. 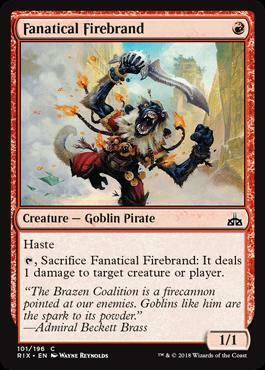 Two dead creatures from anywhere already boost her to a 3/3, and her Lifelink ability will chew on attacking opponents’ creatures, negating any damage the others do to you. Legion Lieutenant is an easy partner for Elenda, already guaranteeing at least two tokens should she be killed on the spot. Anoited Deacon naturally makes killing her a fool’s errand, and Duskborne Skymarcher helps in a pinch. Even Pirate’s Cutlass helps Elenda in all the right ways, making her a threat both alive AND dead. On the flip side, even if an opponent pings her and kills her immediately, she still leaves behind her own 1/1 Lifelink token, meaning your opponent essentially has to kill her twice. Not fun. Just beware of Moment of Craving. -1/-1 abilities will not get you any tokens when Elenda dies. 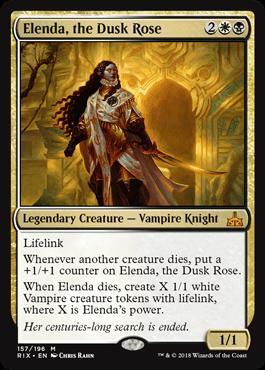 Elenda is a great card that makes Vampires all the more scarier, not a good thing given that it was one of Ixalan’s better tribes. Thankfully, at mythic rare, she won’t be turning up all that often. Yes, even more Black/White cards, and don’t think we’re stopping here! 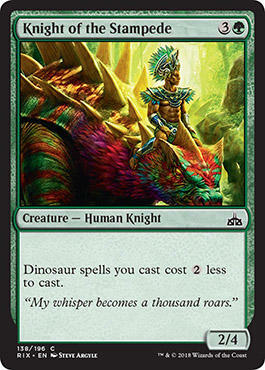 These colors benefitted the most in Rivals of Ixalan. This card is just obnoxious. Five mana for Instant speed exile is a bit hefty, but there is a tune of inevitability when it comes to this card. 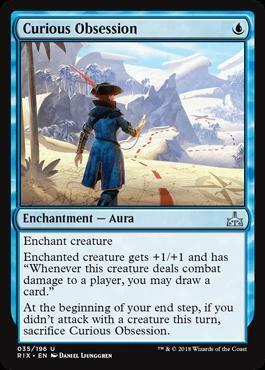 If you play this on turn-3 and survive the onslaught of creatures, your opponent won’t be able to play anything noteworthy without the threat of losing it right away. 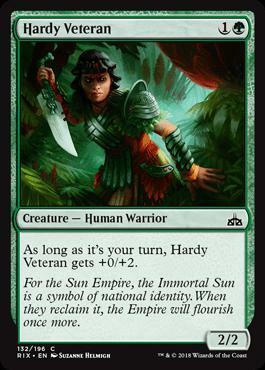 Ghalta, Elenda, everything shy of Carnage Tyrant or Jade Guardian is a wimp in the face of this card. And, oh boy, it gets even better! 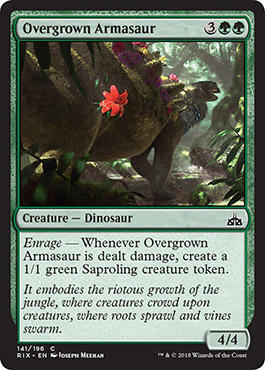 Once an opponent loses three creatures to this card, it flips into a Legendary Land, meaning it becomes even harder to get rid of. Its special ability allows you to throw those creatures right back into their faces. 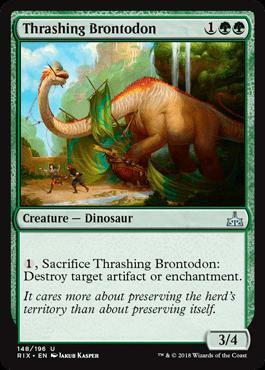 Ugh, using creatures against their owner is a low blow, and this card is destined to lose your friends. At least you’ll probably win a few games off of it. You’re not likely to lose if it takes hold. You want to know how to make White removal not totally boring? 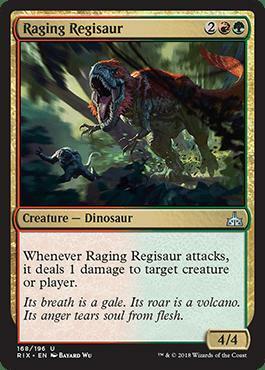 Slap it on a 5/5 Dinosaur and make it his Enrage trigger. Trapjaw Tyrant is a nasty card that can hold an entire army at bay by its lonesome. 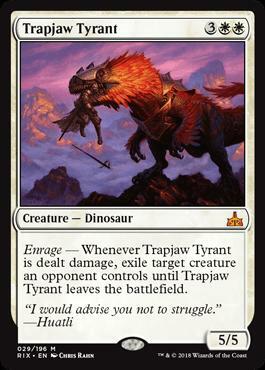 Opponents dare not attack into Trapjaw Tyrant since he can block and likely kill the weakest creature and then immediately turn his attention to the biggest creature, creating a two-for-one that you opponent himself triggered. Attacking with Trapjaw Tyrant means opponents will definitely have to double block to kill it, still getting you that two-for-one. The only weakness of Trapjaw Tyrant is that killing him floods the opponent’s board with all of their creatures, primed and angry to strike back. I guess the tyrant only hides them in his nest… doesn’t eat them. Impale, Contract Killing, and… Ravenous Chupacabra all effectively remove Trapjaw Tyrant without damage. Watch out for Black players with this guy. I think we’ve reached the apex because not even Ravenous Chupacabra can deal with Rekindling Phoenix effectively. 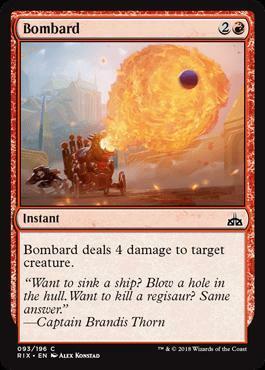 This is a 4/3 flyer for four mana, already an amazing bargain. 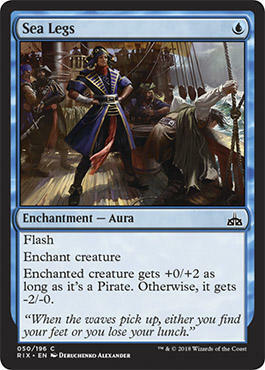 However, unlike most rare Red cards in Magic: The Gathering, that text box is actually incredibly relevant to the game. In practice, Rekindling Phoenix can’t die. It’s difficult to find any creature that can block and kill a 4/3 flyer in the first place, so that means removal spell. Play the Ravenous Chupacabra, kill the Rekindling Phoenix and… it’s back the next turn with Haste and stronger than Chupacabra in every way. 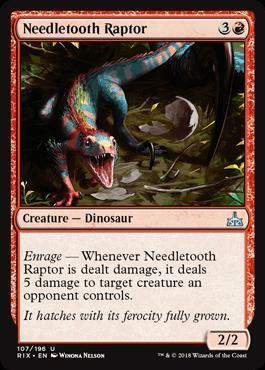 This card completely negates Ravenous Chupacabra‘s two-for-one ability. Sorry chum, you’ve met your match. 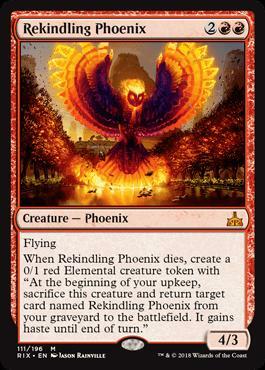 The only way to consistently kill Rekindling Phoenix is to use two removal spells on it, killing both it and the token it leaves behind. This must be done on the same turn, mind you. On turn-6, after you’ve already been smacked for 4 damage the previous turn, it takes four mana for the Impale, two mana for the Moment of Craving, and congratulations, you used two powerful spells and an entire turn to kill one card. Feel good about yourself? Ravenous Chupacabra fails in the face of his big brother, Tetzimoc. 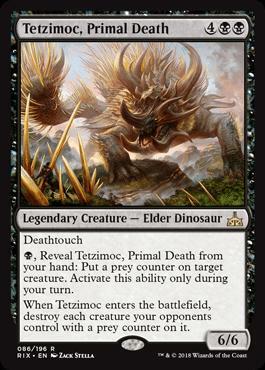 Where as it can only kill off one creature when it comes into play, Tetzimoc can wipe an entire board and leave not a 2/2, but rather, a 6/6 Deathtouch in its wake. That’s a bit overkill on the Deathtouch, isn’t it? Every single turn, a single Black mana essentially marks a creature for death on turn-6. If successful, it’s game over. There’s no coming back from that unless Tetzimoc is dealt with right away. 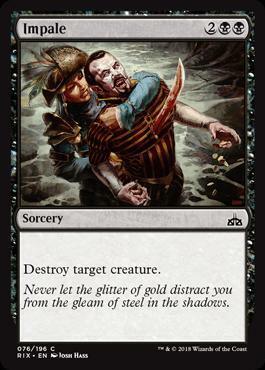 And again, as mentioned for Ravenous Chupabara in the uncommon review, there is plenty of graveyard recursion in both Ixalan and Rivals of Ixalan. Just get him back a turn or two later, mark a creature or two on the spot, and boom, blow them up too! Not good odds. Don’t gamble on them. You can’t beat Tetzimoc.